ALBUM | Is he the greatest rapper alive? What do we expect from mega-artists in the age of constant content and streaming? How political does an artist need to be today? DAMN. allows for all of these discussions to take place, without Kendrick Lamar really demanding them. 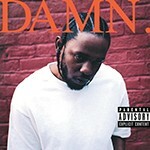 The new album, by a rapper given the belt after his acclaimed releases of good kid, M.A.A.d city in 2012 and To Pimp a Butterfly in 2015, largely sounds introspective. The album's second and third tracks — "DNA." and "YAH." — address the frustrations of a lyricist whose own words are often misrepresented; the lead track, "BLOOD. ", and "DNA." feature samples of Fox News personalities lamenting perceived anti-police discrimination found on "Alright" from To Pimp A Butterfly. His new album shows Lamar's range as not only a bar-spitting killer, but a sing-song rapper who creates memorable choruses. DAMN. is further proof that Lamar is a master of rap for the purpose of his art, not just for the sake of his mastery. TV | In Trump's America, Stephen Colbert may be the new king of late night, but DESUS & MERO (Mon-Thu at 11 pm, on Viceland) are its underground kings. Desus Nice (Daniel Baker) and The Kid Mero (Joel Martinez) took their podcast Bodega Boys and reformatted the program into a four-nights-a-week show that's central to the programming of VICE Media's new cable channel. 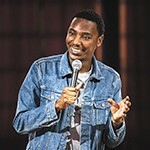 The show, which plays as local access television for the internet age, with formatting reminiscent of '90s hip-hop radio and fast-paced debate shows like Pardon the Interruption, is masterful in exploring the intersection of race and culture in America with a style that's straight outta the Bronx, yet still accessible to a guy in Spokane.